The Android sample app was developed using Android Studio environment. AppsFlyer’s Sample App enables you to see how our newest SDK is integrated into a working project. You can use this project as a reference to your own project to verify and debug the integration process. In addition, you can use the sample app to run end-to-end test scenarios and review the results in your dashboard, such as reports and Push API. For your convenience, the project contains instructions in the comments under the tag: AppsFlyer. You can use this project to test the functionality of the SDK and view changes made in your AppsFlyer dashboard. Change the package name to match the name configured in your AppsFlyer dashboard (your new package name must be unique). Make sure your new package name appears in all references throughout the project (Make sure the same name appears in build.gradle). Under the Java directory, open the Java file MainActivity.java. Replace your_dev_key with the one enlisted under the SDK Integration section of your AppsFlyer dashboard. 4. Build the App to your test device. Make sure your test device is whitelisted in your AppsFlyer dashboard - refer to this article for more information. Now you can test the sample app on your device, and see the changes in your dashboard! 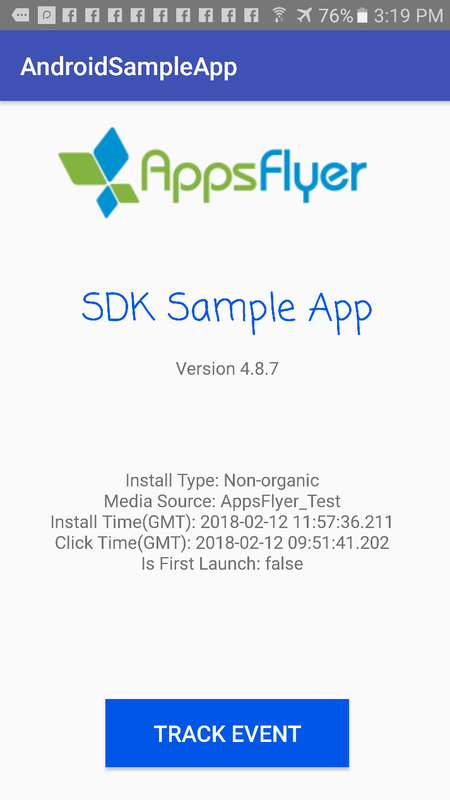 Make sure to use a custom generated AppsFlyer link before installing the app on your device, to receive a non-organic Install. Attribution Values: Shows the core values of your installation - You can see if you received a non-organic install after clicking a custom link, as well as your media source, click time (on your link) and install time (on your device). Track Event: Click this button to launch an event tracking call which you can view in your dashboard (See Deep Linking below for details of customization of this button). The sample app project contains a button to trigger a custom event tracking call. By default, this button is set to track a purchase event which can then be viewed in your dashboard as a revenue increase of $200. If you wish to test additional events, you can find the code for this tracking in the MainActivity.java file, under the buttonOnClick method. To review all available event types which you can track with AppsFlyer’s SDK, refer to this article. In addition, under the registerConversionListener method, you can find several attribution parameters which are shown in a TextView. To view all available parameters, refer to this article. For unpublished apps and parameters other than the ones which are printed in the default code of the sample app, are returned as Null. 1. Go to the AndroidManifest file. 2. Edit the <data> tags under <intent-filter>, inside Deep link <activity>. 3. Generate a custom media source link using AppsFlyer’s dashboard. Refer to this article for guidance. Make sure to include "&advertising_id=YOUR_ADVERTISING_ID" in your link to receive a non-organic install. In your AndroidManifest file you can view your custom deep links’ schemes and hosts and change them as required. They are located under the <intent-filter> tab inside the Deep Link <activity> tab. 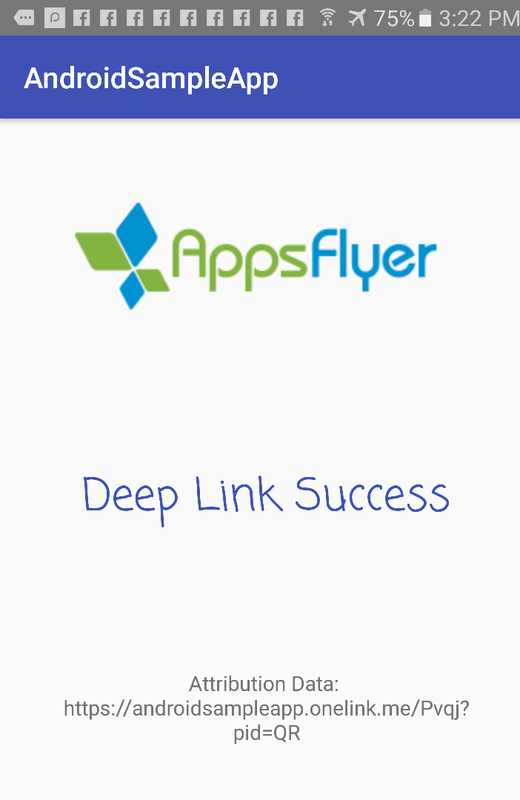 Ensure the app is installed on your device before testing the deep links, as unpublished apps are not redirected to Google Play in case they are not pre-installed. You can also view the link you navigated from into the activity. By using the sendDeepLinkData method in the Deeplink.java file (located in onCreate), you can attribute the deep linking to the corresponding media source.